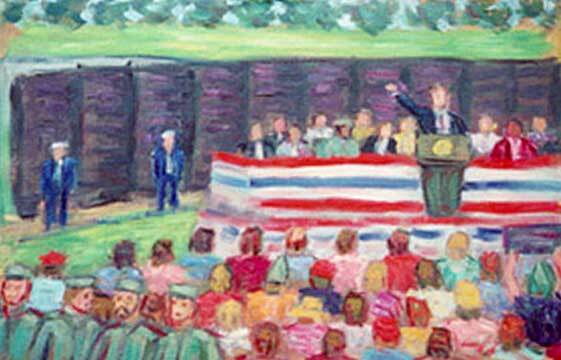 "President Clinton at the Vietnam Memorial (Sketch)"
On Memorial Day, 1993, President Clinton became the first American President to visit The Vietnam Memorial Wall. The President had a rocky relationship with a number of veterans' groups, and some demonstrated at the address by turning their backs. One of President Clinton's greatest assets is his ability to build bridges between opposing factions. In this picture he's reaching out to his opponents. One of the demonstrators in the foreground hears his message, and is turning to listen to embrace the President's message of unification and healing. President Clinton finally closed the long festering wound of Vietnam. This picture was a sketch for a big picture that never got painted. It's vibrancy and life precluded a bigger, more polished and finished work. in much the same way that many of Ruben's big pictures lack the energy and freedom of his oil sketches. This is the first of my pictures of defining monents of the Clinton Presidency.